Cathy Heck leads Cathy Heck Studio, a family run business who have been creating original and inventive artwork licensed for products from baby books to stickers, dinnerware to wall coverings for 30+years. From three studios across the country, they deliver every aspect of a project from the first concepts to final press-ready electronic art, collaborating with clients to create designs that customers love and buyers love to sell. Cathy shares her thoughts on the industry, and the critical balance between work and family (in her case, actually working with family!). 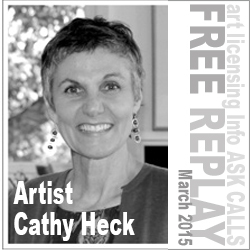 She covers the topic of the habits needed to be a success in art licensing, as well as answers to some of the basic licensing questions and concerns suggested by other artists.